Car games are an excellent way to squash the Are we there yet? Are we there yet!? that we are so familiar with. If you have ever traveled with kids you know that the car could never move fast enough. 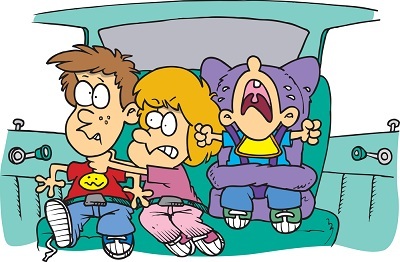 Even with all the modern gadgets in vehicles today children still get bored and need a way to pass the time before the family vacation becomes a family feud. These games are intended to be played in a car or bus. Although some of them may be played in a plane we recommend you check out our Mind Games and Pencil and Paper Games pages for additional games that may be better suited for other forms of travel. Name all the objects that you see in alphabetical order from A to Z. It sounds like a swarm of bees in the room when this game gets going. Buzz-Fizz! For those who mastered Buzz and Fizz give this game a try. Use your skills to make a rhyme and guess the word in no time. Try to make the other players smile and resist their attempts at making you smile. Fizz! Fizz is fun with fives. Discover the pattern and join the picnic. Go-Moku is a multi-player game similar to Tic-Tac-Toe that originated in China. What did you put in Grandmother's Trunk? The classic guessing games that is enjoyed by all ages. Number Tic-Tac-Toe is a variation on the classic Tic-Tac-Toe game with a math twist. It is not only more challenging, but also reinforces basic addition skills. The Peg Game made popular in recent years by Cracker Barrel restaurants has long been an intriguing challenge for people of all ages. The puzzle is frequently referred to as the I.Q. test and often proves difficult to solve even by those who have solved it before. Create as many words as quickly as possible from the letters given by the Spell Cube. Slap-Jack Quick eyes and even faster hands will be your key to success in this fun kids card game. Tongue twisters tangle up even the most talented talkers. Try some of these favorites. The classic game Twenty Questions also known as Animal, Vegetable, or Mineral is a game of deductive questioning in a quest to uncover a mystery word. With a standard deck of cards the backseat battlefield can become an organized game of War. In Word Lightning coming up with words can prove to be quite a challenge.